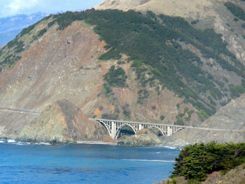 For a road trip full of visual highlights, drive California Big Sur Highway... the central part of California Highway 1. The whole Pacific Coast Highway is dotted with names that show up on tourist's lists from all over the world. ...Parks and beaches to explore and enjoy. CA Hwy 1 - Carmel to San Francisco. 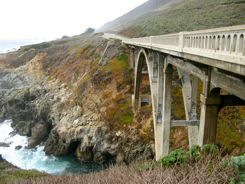 The California Big Sur Highway is the section of the Pacific Coast Highway from Cambria in the south to Carmel in the north. This 90 miles (140km) of highway packs a lot of visual punch. It compares with driving Italy's Amalfi Coast Road or Australia's Great Ocean Road. 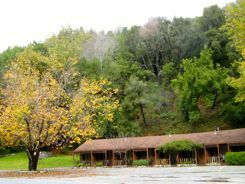 When you drive California Big Sur Highway, you'll find you're on a two lane road that hugs the mountains with dense pine forests, stands of redwood trees, or California chaparral depending on where you are. 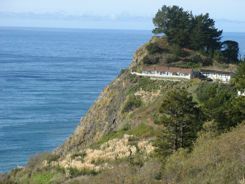 It clings to steep cliffs above the Pacific on the shoreline side. It twists and turns and climbs over spectacular bridges that span precipitous canyons. There is really no way to get lost, since you are pretty much caught between the mountains and the sea. There are lookouts where you can pull off to admire the scenery. Stop and look for birds and sea life. 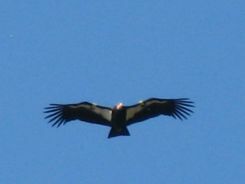 You might get lucky and spot a Sea Otter or a rare California Condor. There are a limited number of places where you can stop to eat. Take a picnic if you want to enjoy the long wild stretch between services where you can find numerous state parks and beaches where you can enjoy an alfresco meal. 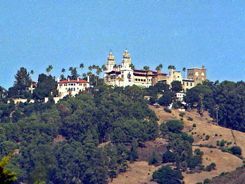 The little town of Cambria and Hearst Castle at San Simeon anchor this section of the Big Sur Highway to the south. ...there is a long stretch of about 40 miles (65 km) where no gas is available. 90 miles (145 km) doesn't sound like it's too far, but you will only average about 30 miles a hour (50 km per hour) due to the traffic, the other gawkers, and the time you spend at scenic spots. You'll go even slower if you have a passenger prone to motion sickness. Big Sur and Carmel anchor this section of California Highway 1 to the north. If you're not making this part of a longer drive along the whole of Highway 1, you can drive it round trip in a day if you want to. You can start the round trip from either Cambria or Carmel depending on whether you want to end up in San Francisco or Los Angeles. If you are only driving one way, many guidebooks say you might want to make it from south to north. You'll be driving on the inside of the curves, and most guides say that the views are clearer toward the north. That said, since we live close, we drive it both ways in a day or weekend trip, and it's still a very pretty drive heading south. 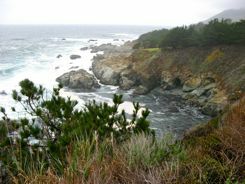 The scenery of Big Sur is the main attraction for this part of your drive. In the spring, the wildflowers are spectacular. ...or cold and foggy at any time of the year. We encountered both on a December weekend. Be sure to check on road conditions. California Highway 1 is prone to landslides during the rainy season which is winter in California. So if you plan to drive California Big Sur Highway, you'll want to know if it is closed at certain times of the day for maintenance... or possibly even closed completely into spring if a slide was particularly bad. There are plenty of places to stay in the Cambria area and again in Carmel and Monterey. In between your options are limited though there are places to camp, a few modest and quirky hotels, and a couple of very high end places. It's best to check into this before you start driving, and probably best to have a reservation. This is a popular drive for tourists from all over. If you want to drive in only one direction, check around with different car rental companies and compare drop-off fees. 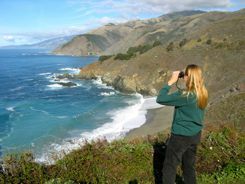 Whether you make it one way or round trip, if you drive California Big Sur Highway, you are in for a treat.